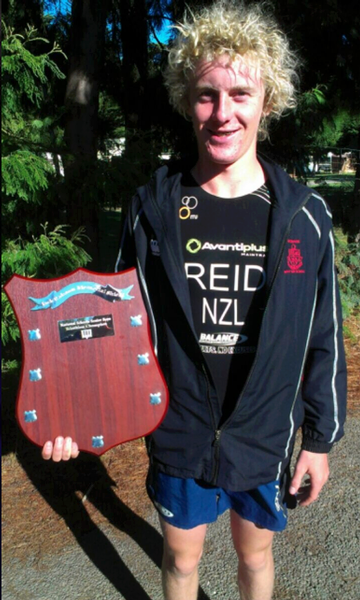 Tayler Reid Gisborne today became the first recipient of the Jack Ralston Memorial trophy as winner of the Contact National Schools U19 boys triathlon title. Reid dominated today’s race at Pegasus, just north of Christchurch, winning by almost 3 minutes and once he had overcome some nervous minutes waiting for his appeal against disqualification to be heard and subsequently upheld, it was a relieved Reid who accepted the trophy. Reid had initially been disqualified for an alleged passing transgression on the bike leg, but a subsequent appeal was upheld by the race jury and technical officials reinstated Reid to the top of the podium. The trophy was instigated by Triathlon New Zealand and the Ralston family to honour Jack and his contribution to the sport. The former coach passed away some 7 months ago but was remembered today amongst the over 800 athletes, coaches, parents and teachers at the Contact National Schools. Gisborne Boys High School student Reid is a fitting first athlete to receive the trophy, winning the U19 title at just 16 years of age and with another year next year at school he will return to defend his title and look to once again have his name engraved on the Jack Ralston Memorial Trophy. The memory of Jack Ralston was kept alive in the words read out to the prize giving in a message from his widow Margaret on behalf of the family, saying that Jack was equally proud of the achievements of his age group athletes reaching their potential just as he was of an Olympic gold medal winning performance. The final words were a catch phrase familiar amongst Jack Ralston athletes of ‘ever forward’, a fitting end to the prize giving for the gathered group of school athletes with their triathlon careers and lives in front of them. Young Tayler Reid is certainly an athlete who can live up to that philosophy as he embarks on his own triathlon career knowing he will always be the first name inscribed on the Jack Ralston Memorial Trophy.